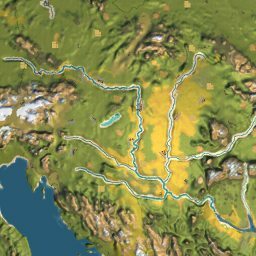 If you are interested in history here is a Wiki link http://en.wikipedia.org/wiki/Austria-Hungary The map is a 15X15 SAM. 96 turns/month. The names of the cities are from a contemporary Rand McNally map, many of them changed several times during the span of the past 100 years. There are three Eras, with three different scenario goals. It will be necessary to rearrange the rail lines. The third Era is: World War I. It is a rather Since the game has 3 different Eras, with different goals, I made separate independent scenarios from each Era: Increased the duration WWI to five years (I changed it from 4, poetic license!) so you have to be prepared for the switch. Be sure to have empty building slots to “build a War industry”. Actually as a former resident of Austria-Hungary (here)*, I would just like to say that the empire ended ~50 km to the East of where this map ends. Anyway, nice job – I’d love to try it out. I have also cut from Austria and Poland. One can not put a square peg into a round hole. How do you connect Lemberg to the Russian Front? I tried extending a railway into past the green line. Do you have any other custom maps installed like say the Fraxis Holiday map? No i I tried a texas custom map and that worked NAFTa II works so I am unsure why this doeasn’t??? Did you remove those other maps before you installed this one? Nope didn’t work. I will go through the steps. Open the zip file and extract to user maps. the folder is empty before i extract the files there. all other map works, why not this one? Exact the folder -> put the Monarchy – Version 2_00 folder, along with ALL THE .tga and .FPK files in the usermaps folder. So Bus I can assume you have it working now? Bus when you extract the zip file it already does that for you. I wish I could do a screen shot the .fpk + .TGA files are in the right place. I will ask the same question have you got this map to work. We have Railroad forum, where all these questions are asked, discussed and answered in detail. The link is at the top of this page “Forums” just click on it. Hi, still cannot get it to work and cannot find anything in the forums about this particular map having problems. It looks like such a great map, but i cannot get it to work…. Nick, have you looked at the comments above about extracting the files? Does the map crash immediately on loading, or what is the problem exactly? There is some problem about producing meat. Maybe I am doing something wrong, but despite corn supply facilities near Przemysl and Praga will not produce meat. Another facility (somewhere near Sarajevo, I don’t rember the name) works OK. Unfortunately, I can not finish the second era, because in the city of Kalocsa has no label Trappist cheese and wine. Lemberg has no industry to receive Feta Cheese, only Trappist Cheese after the “Russian Front” is built. Feta Cheese goes to the “Capital City Distributors” Budapest and Vienna. I built Italian Front in Trieste, but corresponding goal remains incomplete. What’s wrong? Despite these little glitches, a great game full of Janksika’s characteristic long supply lines that take a bit of thought to get working.